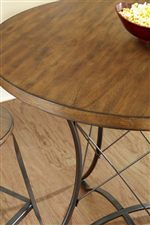 Bring a modern industrial look to your dining space with this round counter table. The piece features a wood top in a natural finish with a metal pedestal base that highlights geometric designs. Taller than an average table, this counter height piece is perfect for a small dining space or breakfast nook, and has a distinctly contemporary look. 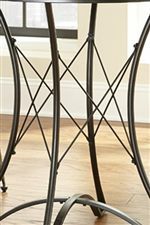 The Adele Round Counter Table with Geometric Metal Pedestal by Steve Silver at Walker's Furniture in the Spokane, Kennewick, Tri-Cities, Wenatchee, Coeur D’Alene, Yakima, Walla Walla, Umatilla, Moses Lake area. Product availability may vary. Contact us for the most current availability on this product.